Sergeant Edward (Ted) Colhoun McLaughlin was the son of Edward & Jeanie McLaughlin, Ballyronan. Prior to the war he worked in Walsley, England with his uncle in his grocer’s shop. During the war he flew numerous missions over Hanover, Bocum, Hagen, Munich, Kassel, Stuttgart, Dusseldorf and Berlin. 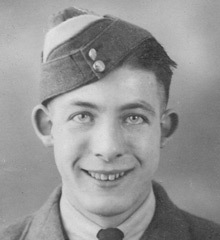 His plane who did not return from an operational sortie on the night of Sunday, 2/3 January 1944.